So I have a little bit of a technical problem at the moment. My faithful Wacom Intuos 3 that I got for Christmas as a junior in college 7 years ago has appeared to have given up the ghost. RIP old faithful. I took care of you the best I could. I went through 2 pens, who knows how many pen tips, and countless papers (I tape a thin paper sheet over the tablet so it feels like I’m drawing on paper, also my hand sweat sticks to the screen if I don’t). I’ve used that tablet almost daily for at least 4 years now, as everything I make is digital and everything was drawn with that bad boy. But I’ve noticed a few bugs crop up over time. The cursor in photoshop would get stuck on certain tools, or change the cursor size at random. Most bugs would be solved by simply switching to my internet tab or in the worst cases, restarting Photoshop. But on Tuesday I had a weird error that locked up my mouse and keyboard and forced an entire restart. It happened a couple more times on Thursday, and it got to the point where my computer would only function normally if my tablet wasn’t plugged in. 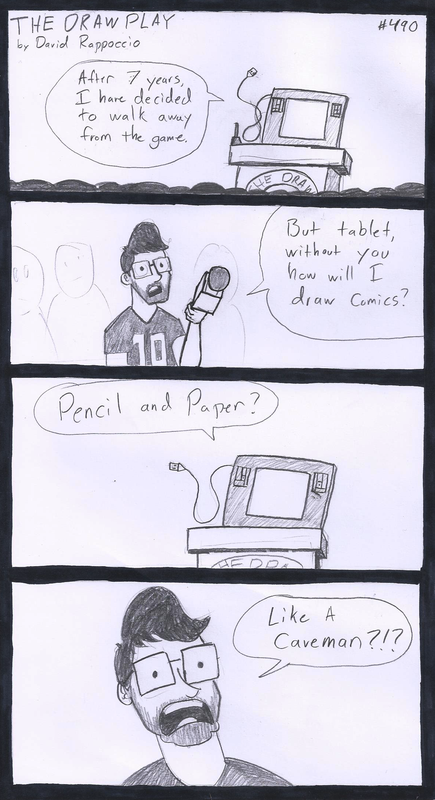 It still worked on my backup laptop, and I made the Rueben Randle comic that way, but even then it got kind of sketchy after a few hours of use. I need to do a little bit more trouble shooting to make sure it’s for sure the tablet but I’m pretty sure my best friend is dead. Even installing old drivers only gave it a couple extra hours of life before it bugged out again. So in the meantime while I gather some funds and figure out what tablet to buy, I’ll probably have to make a few more of these, because I MUST MAKE DEADLINES. 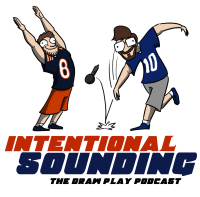 However with the tablet dead, it frees up some time for me to finalize some other IMPORTANT DRAW PLAY UPDATES that I have had planned for a while, so stay tuned later this week (possibly tomorrow) for IMPORTANT EARTH SHATTERING NEWS. Edit: To everyone telling me to kickstart/Gofundme a new tablet, please come back tomorrow, as my announcement will be rather pertinent to your idea. Have you considered getting iPad Pro or Surface tablet? You might now have legit excuse to buy one. Russel Wilson says you need a Microsoft Surface Pro! Start a kickstarter or some other crowd funding, I would throw in some money to help out, I’m sure most readers would as well. I have no idea how comparable it is, but my wife freelances making ads for local businesses and loves her surface pro 3 for that. Sad to hear about your little friend, good luck finding something to replace it properly. Have you considered starting a go fund me for a new one? I’m not sure how you feel about mooching, but I assume a few loyal readers would be willing to help you gather the funds. A glass of Scotch for the old tablet. I know the feel Dave. The tablet on which I (used to) draw has been stuck in an eternal boot loop since January. Thanks for pushing through and continuing the DP. We’ll just call these pen and paper DPs “Special Deluxe Limited Edition Artist’s Renderings”. Do you know how to make lemonade? Seriously though, you have the talent to get paid. You could auction off some drawings or start a crowd sourcing fund. I’m sure we DP loyal would be more then eager to back you and you may even gain some new fans. Brian Patterson over at D20Monkey put up a GoFundMe for a new Mac when his comic machine died, and it funded in a matter of hours. We’d be willing to pitch in to help you get up and running. As mentioned above, put together a GoFundMe or something — you’ll have your spiffy new tablet in about ten minutes. Yes, I know — “I don’t want to ask my readers for anything, I don’t want to ruin my starving artist cred, I don’t want to just…” ok, yeah yeah, we get it, get the formal denials out of the way and then let us make with the Fry “shut up and take my money” gifs. Why are you still here‽ Make with the Gimme-Gimme page already! The replacement tablet will come in and, despite hope and expectations, Dave will one day come in and find the tablet making an eagles banner. Using pencil and paper, its so easy a caveman can do it. The quality of this comic is still better than Bad Comedian Eli Manning. I find it hilarious that you draw so well, but your hand writing looks like my 5-yr old nephews. I know this is getting repetitive but, Kick Start that B! While you transition to a new tablet could I request a Draw Play made with MS Paint?